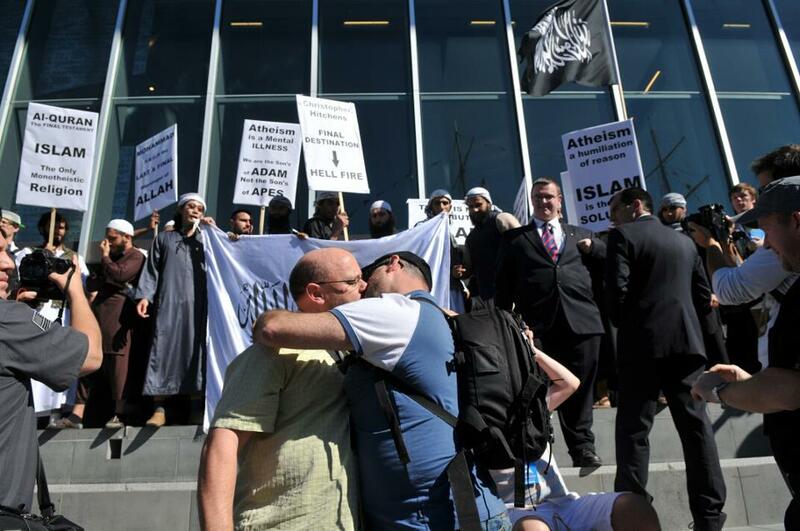 A group of radical, fanatical Jihadi Islamic protesters gathered at the Global Atheist Convention on Sunday April 15 2012. Seemingly they felt that atheism was a threat to humanity and their very existence. Gregory and I had a smooch in front of these whack-jobs and they started howling that we would “burn in hell”. Our friend Pete Darwin captured the moment with my trusty Nikon and the rest is history. If you find any other places that have covered this story, please let me know. Original photographs on Picasa and Facebook. Thanks to Katy Perry for inspiration.